At Fakuma 2017, the WITTMANN TEMPRO plus D temperature controller with SpeedDrive option was presented to the public for the first time, and very successfully. The first orders for this model with a speed-controlled pump were already received before the end of the fair. The energy input must be analysed at every conceivable point in order to achieve an optimised economic performance in terms of power consumption. Basically, mould tempering in injection moulding machines plays a vital part in this context. This ultimately led to the development of temperature controllers, which are now able to utilise the waste heat of a cogeneration unit for mould heating, and which can reduce the power consumption to the minimum required for the process by using a pump with variable rotational speed. The utilisation of waste heat became possible through the ECO-Heating option brought to market in 2014, with which the TEMPRO plus D90 temperature controller from WITTMANN was equipped. With this option, the built-in electric heating element is activated only when the waste heat of the cogeneration unit is not sufficient to maintain the process. The latest SpeedDrive option has now made it possible to set one of four process parameters (rotational speed, pump pressure, differential temperature or flow) as an additional control variable to achieve energy-optimised operation without jeopardising the process. An inspection of the entire temperature control circuit has revealed several different areas where energy can be saved. Better insulation of the moulds and tubes already reduces the power consumption to some extent. This effect is more pronounced with higher processing temperatures (> 100 °C) than with lower temperatures. As for the pump, energy savings can be realised by using more efficient motors. In 2016, for instance, the efficiency class IE2 motors then used by all manufacturers were still the state of the art. The degree of efficiency of such a 1.1 kW motor was between 79 and 79.6%. In response to new environmental regulations, the motor manufacturers changed from IE2 to the efficiency rating of IE3 at the beginning of 2017. 1.1 kW motors of this type reach a degree of efficiency ranging from 82 to 82.7%. This development was followed by the pump manufacturers, which now also use class IE3 motors. The SpeedDrive option consists of a pump equipped with a permanent-magnet synchronous motor. In combination with a matching frequency converter, this configuration reaches an efficiency rating of more than 86%, which corresponds to efficiency class IE4. In this way, the power consumption of the motor can be reduced by up to 30% when other operational parameters of the pump (working pressure and flow) remain unchanged, which leads to significant energy savings and ultimately to a reduction in costs. Additional savings can be achieved by lowering the working pressure of the pump through reducing the motor speed, which cuts the pump’s power input and consequently the power consumption even further. Here it should be noted, however, that this action also reduces the flow quantity and consequently increases the differential temperature between the mold inlet and outlet. The differential temperature is already influenced by the mould design (number, diameter, length and geometry of the tempering channels) and the type of connection to the mould (diameter and length of the tubes between the temperature controller and the mould, as well as serial or parallel flow through the tempering channels). The differential temperature is a very important indicator concerning the thermal balance of a mould and the homogeneity of temperature distribution inside the cavities, and it should be pre-defined for every mould, depending on the product to be manufactured. Once the differential temperature has been calculated for a given application, it can be set as a fixed parameter for the TEMPRO with SpeedDrive and monitored by defining tolerance margins. 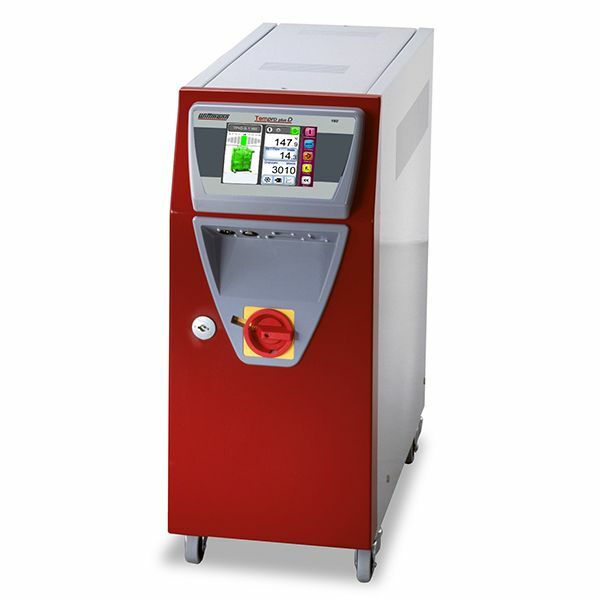 In the event of any change in the injection moulding machine’s process parameters which have an effect on the cycle time, the temperature controller responds to such a change by increasing or reducing the motor speed of the pump to maintain the set differential temperature. Regardless of which parameters have been set: a TEMPRO plus D equipped with SpeedDrive gives processors a decisive head start in terms of process accuracy over appliances with conventional pumps, since the variable speed makes it possible to adjust the operating point of the pump to the process.